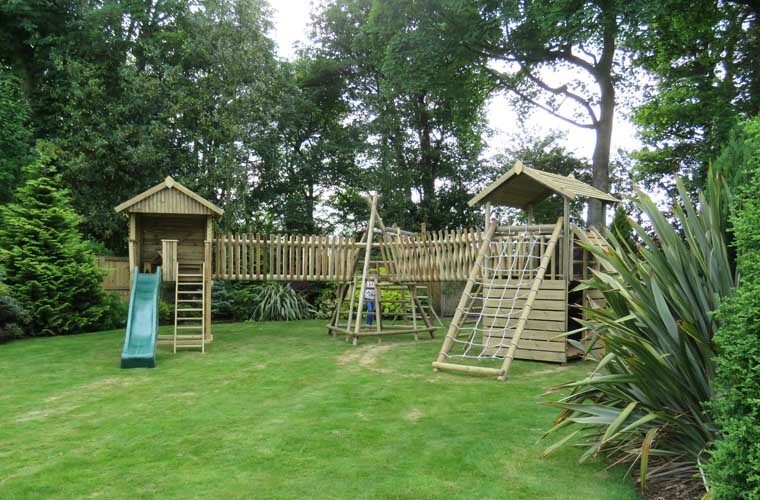 Caledonia Play installed the following three tower structure: The first tower unit is a Garden Play House structure constructed from timber with a 3.0m fibreglass wave slide and a set of access steps. The timber used is Northern Scandinavian Pine and the machine rounded timbers are slow grown Norway Spruce. All our timbers are pressure treated with non-arsenic based preservative salts, then impregnated with wax. This product comes with a Child’s Table and Bench Set – table and two benches – as standard. 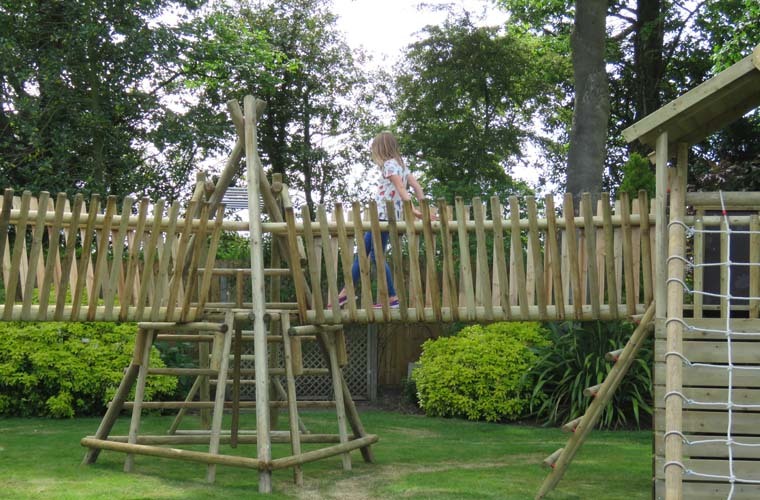 This fits nicely into the Garden Play House or can also be moved to the lawn or patio for tea parties in the garden. 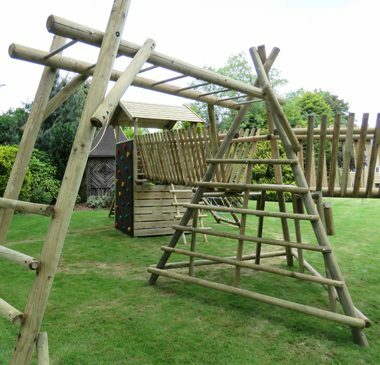 The second tower unit is a pyramid shaped structure combining access ladders and a raised platform - the triangular footprint allows the structure to be extremely stable and this in turn becomes an excellent centre point for the whole climbing structure. 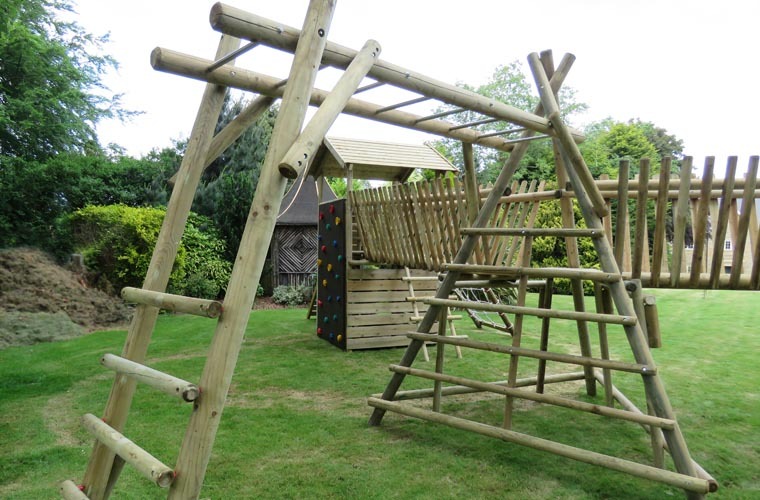 The third tower unit is a Garden Play Fort with an access ladder, a net frame and a climbing ramp with pull rope. This tower also has a roofed section as does the Garden Play House offering a place to shelter if required. Two beautiful timber bridges connect the three towers together and enable the overall footprint of the structure to be more interesting as there is a small change of direction due to the triangular tower being in the centre. 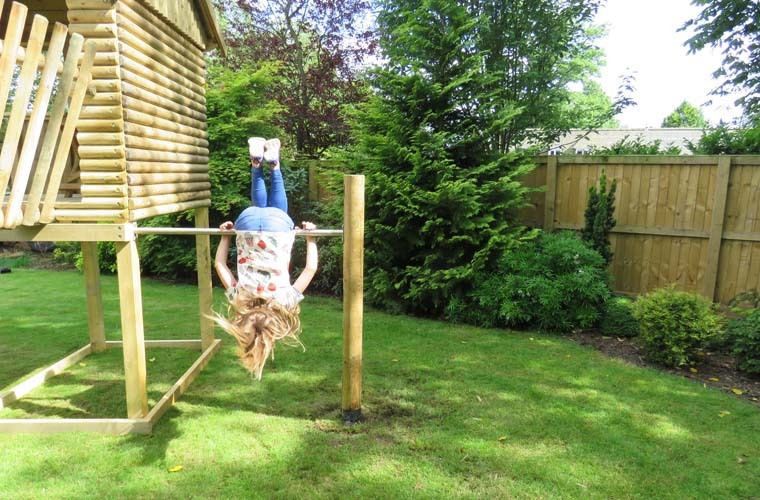 Caledonia Play also installed the following add-ons: A single Tumble Bar has been fitted onto the back of the Garden Play House. 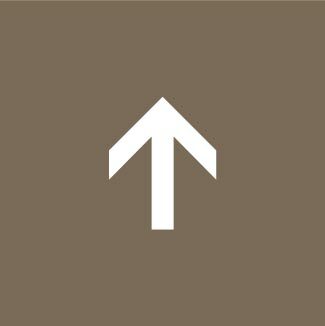 Sometimes also called a chin up bar – this product is robust and made to last. Constructed from quality 12cm machine rounded timber, the pole is 2m long 0.6m of which is cemented into the ground. The tumble bar itself is made from stainless steel. A Monkey Bar Ladder has been attached to rear end of the central Pyramid Tower Structure adding both play value and structural stability. The Monkey Bar Ladder is of a heavy-duty construction with metal rungs. This product is ideal for developing upper body strength and coordination. A Climbing Rock Wall offers a unique way to access the Fort structure with specially designed coloured rock climbing holds that are suitable for both hands and feet to use. 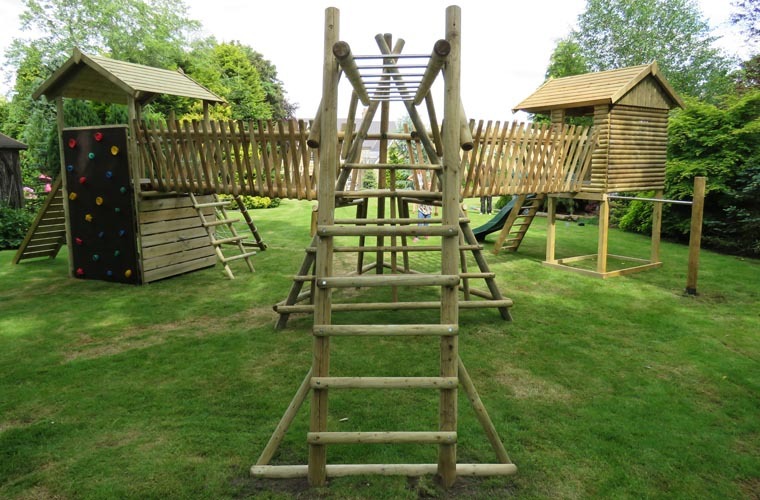 Caledonia Play also installed the following products: A 25 m long Flying Fox has been stalled with a starting platform at one end and a compression spring system at the finish to ensure a safe, controlled ride to the end. The timbers are pressure treated and fitted with post saver sleeves to protect the section below ground level. The main cross beams are metal and have a tensioning winch which ensures that the wire can be tightened as needed – the wire will stretch with use. The carriage is made with stainless steel with nylon roller so will not rust, it is enclosed so it will not blow or fall off the cable. The final element that we installed is a Family Basket Swing. The swing frame is extremely robust using larger poles than our standard swing frames in order to support the heavy basket. The basket, which is made with an internal galvanised steel ring, stainless steel chains and herculean rope, is of commercial standard quality and conforms to European Safety Standard EN1176. 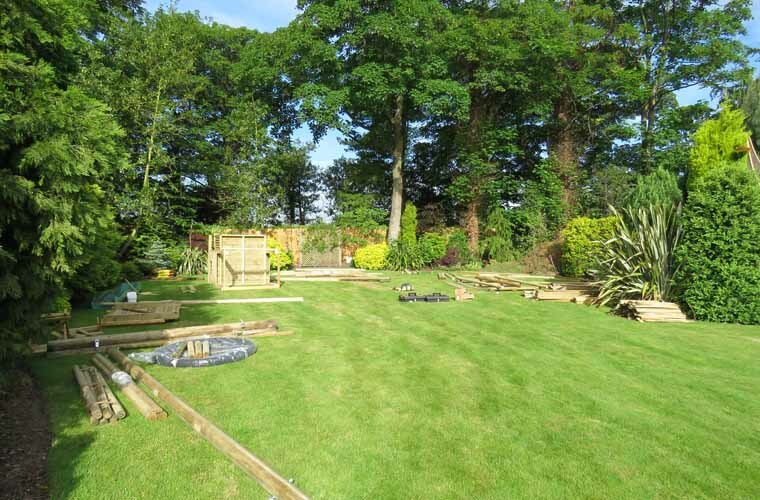 The clients had recently moved to a new house and were looking to install a selection of timber play equipment in their large garden. They were looking for something that would be future proof and in particular wanted something that would be suitable for all their three children. By working carefully with the clients we were able to pinpoint which products are best combined for the ability, size and age of the children and young adults who will be using it. We pride ourselves in being able to create unique combinations that are not also attractive and with huge play value but are also safe. 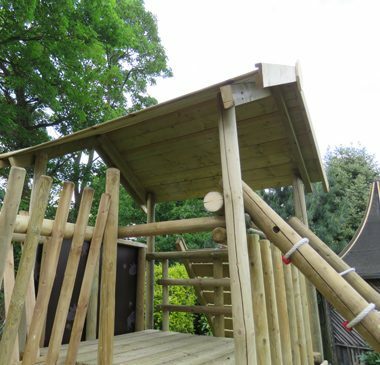 The result Caledonia Play installed a three tower structure: A Garden Play House, a Garden Play Fort and a Pyramid Shaped Structure. These are linked by two beautiful timber bridges to allow easy access from one tower to the others. 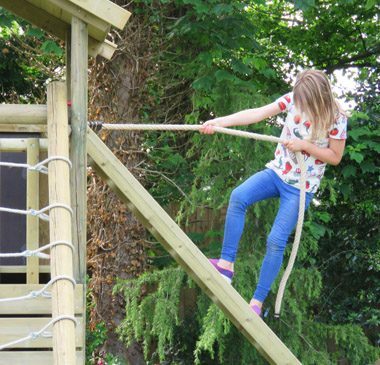 A single Tumble Bar has been fitted onto the back of the Garden Play House and a Monkey Bar Ladder offers an alternative way to access the rear end of the central Pyramid Tower Structure. Finally, a Climbing Rock Wall is fixed onto the back of the Fort structure. 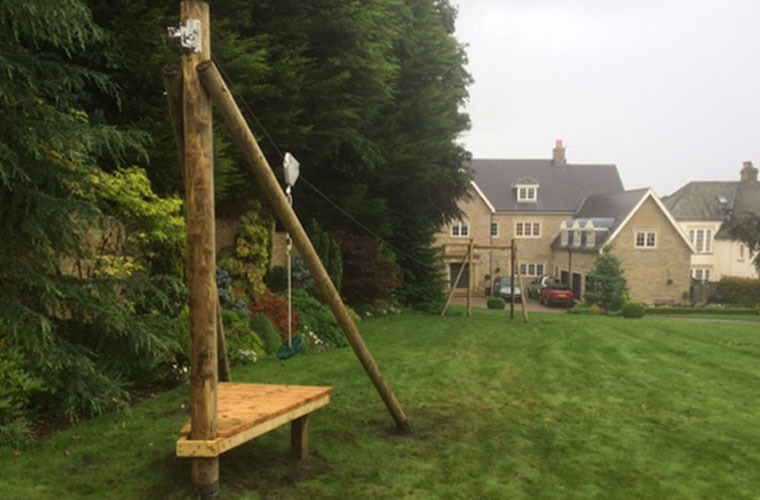 Caledonia Play also installed a unique 25m long Flying Fox System and a Family Basket Swing to finish off the project.